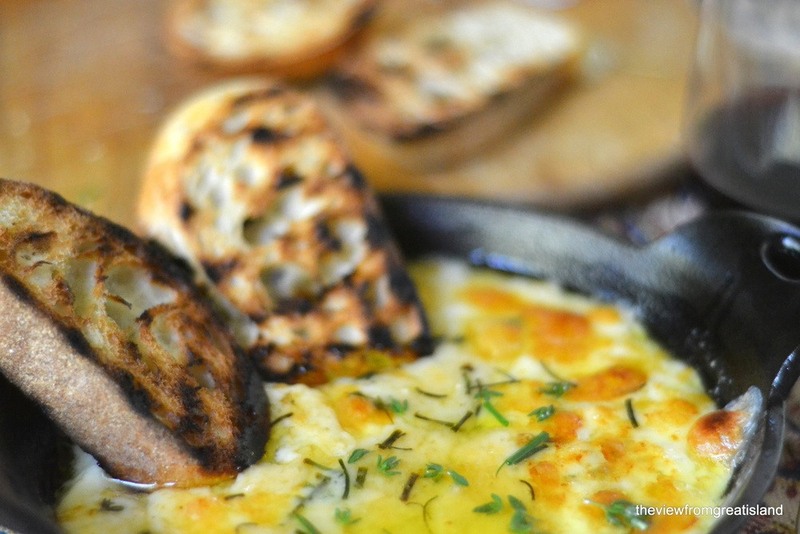 Simple Baked Cheese ~ a memorable appetizer that's as easy as it sounds. It works equally well for game night and date night! Slice the bread, I like to do it on the bias to get more surface area. You'll need approximately 8 to 10 slices. Heat a grill pan over medium to high heat and toast the slices until they are browned and slightly charred, about 4-5 minutes per side. Watch them carefully. While the bread is still warm, run the cut side of the garlic along the surface, this will give it a nice subtle flavor. Set aside. Remove the rinds and cut the cheese into cubes, about 1/2 to 1 inch. Put them in a small cast iron pan, or other small broiler-friendly pan, about 5-6 inches in diameter. Add the oil and Kirsch. Sprinkle the herbs across the cheese. Broil about 5 inches from the broiler for about 10 minutes, or until the cheese is browned and bubbly. The time will depend on your pan, your oven, and how far your pan is from the heating element. I put my rack on the highest position and it took 10 minutes. Watch it like a hawk. Serve right away with the grilled bread.